We recently sat down with Val Dietl Baron, SVP of client and partner development at Tru Optik, to chat about the growth of over-the-top (OTT) and connected TV (CTV) video and the opportunities for audience targeting and measurement in these environments. As an ad tech veteran at a leading CTV data management platform (DMP), Val had some great insight and wisdom to share with us. What excites you most about the growth of OTT/CTV? Streaming TV has become a mainstream behavior — the consumer is in control, and advertisers are following. OTT brings the best of both worlds, combining the advanced audience-based buys with the precision targeting of digital and the premium content and full-screen experience of TV. What is the most important statistic you’ve seen recently to support this? In the last five years, U.S. households with one or more CTV devices went from 38 percent to 74 percent — this is equivalent to 93 million households. Who would have said five years ago that three-fourths of the population would stream TV? Among the households with a CTV, OTT accounts for 33 percent of TV viewing. This is a phenomenal statistic that shows that not only has OTT changed consumer behavior but also advertisers will have to follow if they want to stay in this game. Why do you think the industry has been slow to move ad dollars to OTT? Legacy measurement systems lack cross-screen capabilities and scale. The two fundamental requirements needed to measure OTT are cross-device reconciliation and scale. None of the legacy media approaches check both boxes (see table below). Why has Tru Optik succeeded in OTT/CTV targeting and measurement while others have struggled? Many have tried to enter this market but failed because they have approached it with a desktop/mobile mentality. Tru Optik, on the other hand, is becoming the de facto standard for audience segmentation, campaign measurement, and privacy compliance across OTT/CTV because we approached the space with an OTT/CTV-first mentality. Our audience targeting and measurement methods and technology are built from the ground up to meet the needs of OTT. What does it mean that an audience is validated? It means that every campaign impression is scrubbed against our OTT Household GraphTM of 75 million homes to verify exposure, timing, frequency, and device types. It also means confirming that the audience you reached is the audience you targeted — not only in terms of age/gender but also the advanced characteristics OTT enables advertisers to reach. What is the purpose of the household graph? 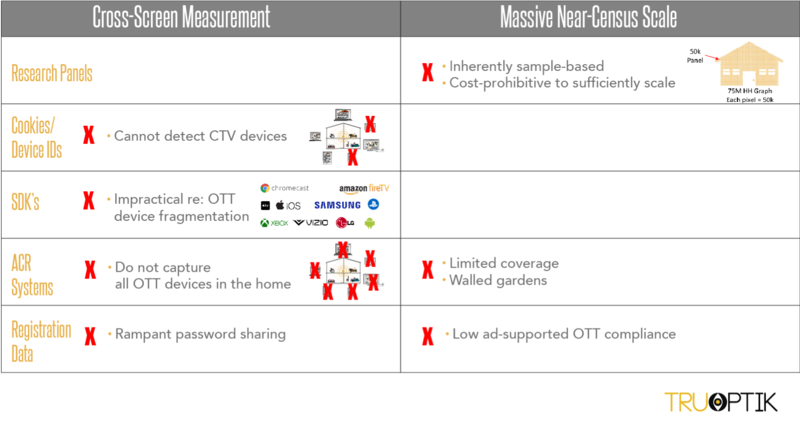 Unlike ”Device Graphs,” which probabilistically attach devices to individuals, Tru Optik’s Household GraphTM assigns an anonymized identifier to each household and deterministically links all OTT devices in the household to that identifier using Smart TVs and streaming media players like Apple TV and FireTV, which never leave the home as anchors. The Tru Optik Household GraphTM is the only system that provides the scale and cross-device resolution advertisers need to take full advantage of OTT’s targeting and measurement capabilities. How did you select and curate the top segments available in SpotX and why would buyers be interested in them? We selected them based on scale and popularity. They are interesting to buyers because we went through a process of narrowing down 3,000 segments to 60 segments, grouping just those segments that were the most popular and scalable. How does indexed linear TV compare to audience validated TV? If you compare an index linear buy to a CTV buy, the CTV buy will be much more precise, reaching only households in the target. It is truly audience-based targeting. The index linear buy is contextual. It buys entire programs whose audiences index above average for a target group. As a result, the CPM for in-target impressions will favor the CTV buy. In this hypothetical example, the target incidence for “luxury car intenders” is only 2 percent. This means that only 2 percent of the population are in-market for luxury cars. When we do an indexed buy, the strategy is buying programs/day-parts that are contextually relevant. A show with a 500 index would be desirable, though only 10 percent of its viewers (5 x 2 percent) are in the target. 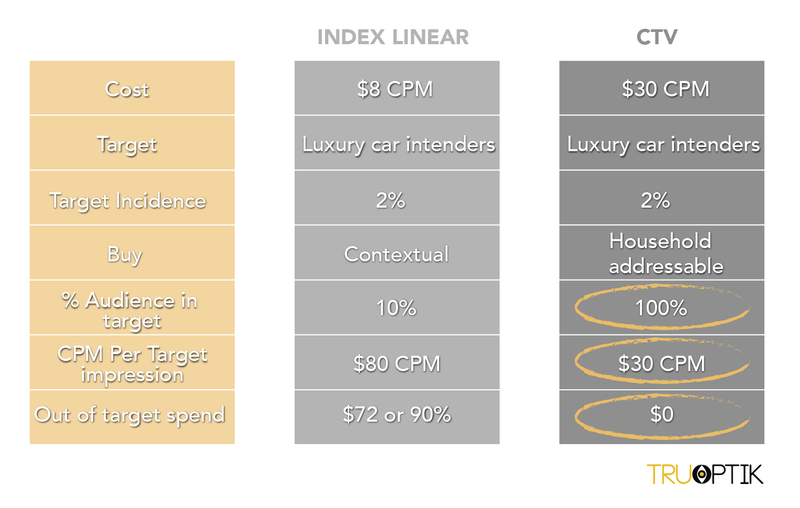 The “in-target” CPM is $80 for indexed linear, while it’s $30 in the CTV strategy. Thus, while CTV might seem to be more expensive at first glance, you are reaching only your intended target audience, whereas in the indexed linear strategy you are wasting a lot of money reaching people that are not interested in the product you are advertising. What are 1-3 key ideas you want readers to take-away from this post? Streaming TV has become a mainstream behavior. Tru Optik’s Household Graph delivers 85 percent coverage of U.S. OTT households, yielding CTV/OTT audience match rates that are 2-3 times higher than traditional DMPs. This translates to 2-3 times more data-enabled revenue potential for our DMP customers. Cross-screen measurement and massive near-census scale are the two essential requirements for OTT targeting, measurement, and attribution. A big thanks to Val for sharing her thoughtful insight. If you’re interested in audience targeting on CTV, contact your SpotX Account Team today to learn more. Val Dietl Baron is the SVP of client and partner development at Tru Optik. Dietl Baron has been responsible for scaling Tru Optik’s rapidly growing client list in the U.S., EMEA and LATAM. 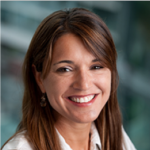 Additionally, she leads a team to build new strategic partnerships and relationships with TV networks, publishers, demand-side platforms (DSPs), and supply side platforms (SSPs). Dietl Baron joined Tru Optik with more than ten years of sales, business development, and product marketing leadership experience. : connected TV, data activation, guest article/Q&A, U.S.